This easy granny square pattern is a variation on the classic crochet granny square. It uses the same first two rounds as a basic granny square, then you finish it with two more rounds of single crochet stitches. You end up a four-round square that's a bit smaller than a classic four-round granny square. The variation is easy and creates a different style from the basic granny square, giving you more options for your designs even if crochet is new to you. The single crochet stitches create a nice finished edge to the squares, so you can use single squares on their own as coasters. Stitch a long row of them together to make a skinny granny scarf or join many of them together to create blankets in varied sizes. You can work this versatile design with any thread or yarn and any size crochet hook. 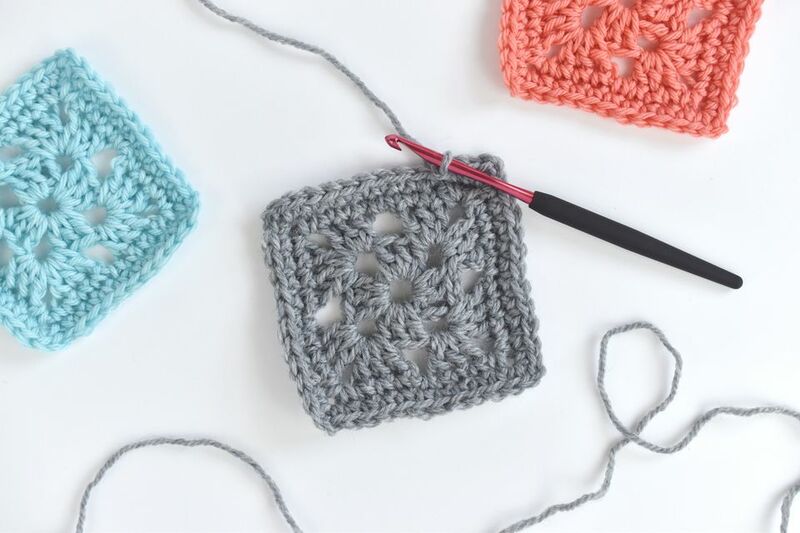 It's usually a safe idea to choose the right hook size for your thread size, but you can play around with different options to get tighter or looser granny squares. You can also vary the size of this square by changing the crochet hook and yarn weight; a larger hook with bulkier yarn creates a bigger square. The examples use DK and worsted weight yarn, both worked with a size I/9 5.5mm crochet hook. To begin this easy granny square, start with a circle. To create your circle, chain five then join with a slip stitch to form a ring. Work round one with clusters of double crochet stitches and chain stitch corner spaces. Chain 3 – this counts as the first dc. Work 2 more dc in the center of the ring. [Ch 2, 3 dc into center of the ring] Repeat the steps within the brackets two more times. Sl st to join to the beginning of the round. You should have a total of 12 dc sts all together in this round, counting the first chain three as one of the double crochet stitches. Some people have different methods than the one above for starting granny squares, and you can use the one that you prefer. 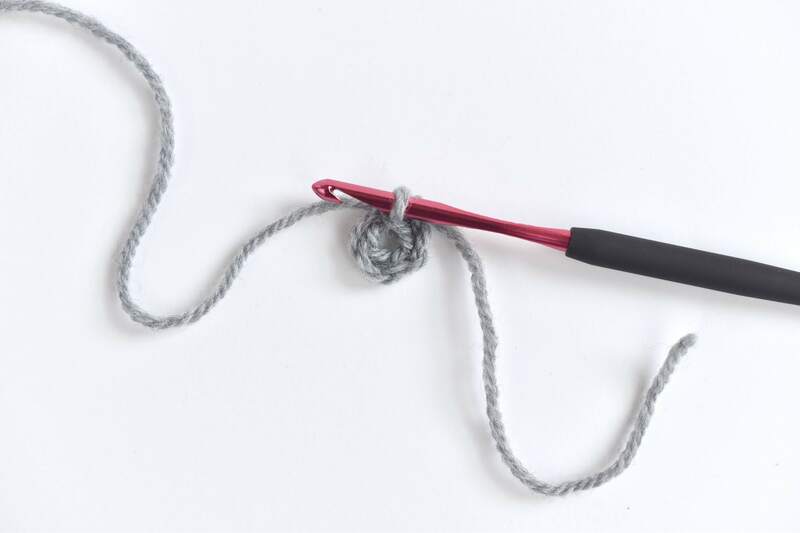 One way to begin a crochet granny square is to chain four (do not slip stitch to create a ring) then start with the second step above, working two double crochet stitches into the fourth chain from the hook. This counts as the first set of three double crochet. Continue the instructions as normal, ending with a slip stitch to close the round. Another method for starting a granny square is to make a magic circle. Then work [3 dc, ch 2] four times into the center of the ring and slip stitch to the top of the first double crochet finish the first round. With this method, you can close the magic circle tighter if you don't want as big of a circle in the center of your square. Work your way over to the corner by crocheting several slip stitches until you get to the next ch-2 space. Begin the next round in this space. Ch 3 – this counts as the first dc stitch. 2 dc, ch 2, 3 dc in same space. [Ch 2, 3 dc in next space, ch 2, 3 dc in same space] Repeat sequence in brackets 2 more times for a total of 3 times. Ch 2, sl st to join the end of the round to the beginning of the round. You should have a total of 24 dc sts in this round. Each corner of the square will have six double crochet stitches separated by a chain of two. Another way to do this step is to make half of the first corner at the beginning and the other half at the end, skipping the slip stitches to the next corner because you can begin in the corner that is closest. To do this, chain three and make 2 more double crochet stitches in the same corner space; that's the first half of the corner. Then you complete the rest of the corners as described above. Next, crochet three more double crochet stitches in the corner where you made the first three double crochet stitches. Chain two and slip stitch to the top of the first chain three to close the round. See the classic granny square crochet pattern for photos that explain the steps in this way. Work several slip stitches so your next round can start in a ch-2 space. Crochet 1 sc in the first corner. 1 sc in each of the next 3 dc spaces. 1 sc in the ch 2 space. Repeat the previous two steps. Chain 2 to create the corner. Repeat the steps above three more times to finish the other three sides, beginning with 1 more single crochet in the same corner, after your ch-2. At the end of the round, slip stitch to close. You should have nine single crochet stitches per side for a total of 36 sc stitches, plus a chain 2 space in each corner. For the last round, single crochet all the way around the square with a ch-2 space at each corner. Sc in each sc across. In the corner, work sc, ch 2. Repeat the steps above three more times to complete each edge of the square. You should have a total of 44 sc sts in this round, with 11 sc sts on each side of the square. End off. Weave in ends. Block if desired. To make this easy granny square larger, repeat round 4 as many times as you would like. With each round, the stitch count increases by 2 sts on each side, with 8 sts total per round. Don't forget that each corner should have two single crochet stitches with a ch-2 between them. Depending on your materials and your tension, you may find that a larger square begins to get too tight. You can loosen your stitches and/or add more stitches in the center of each row to compensate for this. You can also vary the design by adding more rounds of the double crochet clusters like in round two. (For example, make four rounds of a classic granny square and finish with two rounds of single crochet.) Advanced crocheters can have fun playing with the different variations.